Scale matters in Anna Hepler’s show “Intricate Universe’’ at the Montserrat College of Art Gallery. She offers three degrees of it: an installation that fills a large part of the room, three dioramas viewed through small portholes, and a series of ordinary-size woodblock prints. I headed for the portholes first; there’s an inviting intimacy to being the only person gazing at a tiny scene through a small window. This “Project Rooms’’ series also plays with scale: Inside each of the three dioramas, one or two tiny figures, no more than an inch tall, regard a comparatively massive swarm. The small figures in Hepler’s “Projection Rooms’’ don’t behave like Hedren; mostly, they stand and watch, as if in awe. This sets the viewer up for “ARREST, ARRAY,’’ a 24-foot-long installation made of black disks joined by metal rods, suspended like a three-dimensional spider web from the ceiling. The disks concentrate near the front of the piece; elsewhere they are more dispersed. Circle the installation, and the clustering shifts with your perspective, creating the unsettling sense that the thing is in motion or alive. 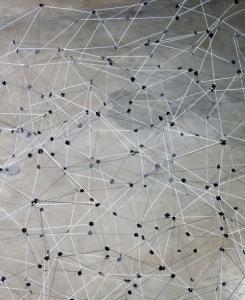 The metal rods add up to a giant network that balloons through the space. While they add coherence, I wondered what the piece would look like strung together on something translucent, such as fishing line; the skeleton of the installation would be gone, and the suspended bits would be even more startling. Still, “ARREST, ARRAY’’ does its eerie, fascinating work. There’s such rock ’n’ roll flash and humor to Joe Wardwell’s paintings at LaMontagne Gallery, it’s easy to miss what a superb painter he is. In this show, he slaps flaming text borrowed from rock lyrics across idyllic landscapes that recall Albert Bierstadt’s epic visions of the American West. The contrast of text and image introduces irony, pathos, and political consciousness into the scene. “Fade Away’’ features those words in sunset yellow and orange blazing across an image of a sunset over a lake, with a spiky, fallen tree trunk extending from the shore into the water broadcasting a message of death. The paint is vaporous and drippy, as if the scene itself is fading. “Any Wonder (Fooling Ourselves II)’’ is a brilliant piece, set up like a postcard. It’s a symmetrical view of a lake circled by trees, with a snowy mountain rising in the distance and the text “Does Anybody Wonder’’ emblazoned across the center. Here, too, dead wood emerges from the water, this time at the bottom center of the canvas, like a finger pointing directly at the viewer. Wardwell renders the water with extraordinary finesse, making surface, reflection, and depth shimmer. Some of the trees stream with drips. The image is almost confrontational and at the same time hallucinatory, quivering toward dissolution. The lights and the emptiness of Lynn Saville’s New York imbue her photographs at Gallery Kayafas with a cool romance. Saville prowls the outskirts of the city at dusk and sets her camera up for long exposures, capturing the different glows of emerging lights - neon signs, construction lights, street lights - as they illuminate their surroundings. The alleyways and deserted parks that she photographs are places that many would not take note of, but through her lens they take on a kind of magic. In “Erie Lackawanna’’ a freight train car sits at the foot of a building bathed in a fantastical aqua light. The building is industrial, its walls corrugated steel, and its interior lights glimmer warmly through the cracks. “Fulton Landing Warehouse’’ puts us inside a roofless brick building, with the U-shapes of the arced windows crisscrossing over the ground in a dance of light and shadows. Also at Gallery Kayafas, Guillermo Srodek-Hart highlights folk heroes of his native Argentina by photographing their shrines. One is Gauchito Gil, a Robin Hood-type figure. “Gauchito Gil Sanctuary’’ depicts a site where people leave offerings, and it’s jam-packed. Bicycles and wedding gowns hang from the ceiling. Knives are collected on the back wall. It’s ridiculously crowded, and bright with color and pattern that give the photograph visual electricity. LYNN SAVILLE: Night/Shift GUILLERMO SRODEK-HART: Shrines At: Gallery Kayafas, 450 Harrison Ave. through Oct. 17.